One of “The Big Three”, ruby is considered the King of Gems. Throughout time, ruby has been historically the most prized of all colored gemstones. Worn only by royalty for many centuries, rubies are mined in Thailand, Burma, and Sri Lanka, with Vietnam and southeastern parts of Africa as more recently discovered sources. 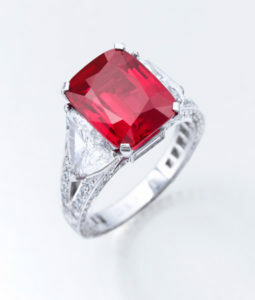 Ruby is second only to diamond in hardness, along with sapphire its mineral cousin. “Pigeon’s blood” red is considered the finest red in ruby. Myanmar (formerly Burma) is the source of the world’s finest quality rubies. Burma’s finer rubies have become increasingly more difficult to find. It is speculated that the mines were played out several decades ago and what was coming out were hoarded goods. However, the U.S. banned trade with Myanmar in 2003. Since then, the trade was limited to what was left in U.S. wholesalers’ coffers, resulting in a spike in pricing. Recently, the embargo on Myanmar was lifted, and Burma ruby can now be found more readily available. In the meantime, African ruby has made a name for itself presenting some very fine specimens. Myanmar is also home to a huge supply of commercial (low) quality ruby, mined in the Mong Hsu region. These stones are opaque, highly included, and milky. Extensive heat treatments, along with filling, make these stones marketable. Rubies are routinely heat treated to enhance their clarity and color. Natural, unheated rubies are extremely rare and command double the price in lower qualities and sizes and more than ten times the price in top quality, larger gems. More recently, commercial quality rubies have been heated and impregnated with a leaded glass substance. In these highly fractured stones, the leaded glass “heals” the fracture and makes it less visible. The level of this treatment can be minimal to extensive, depending on the extent of fracturing throughout the stone. The color of these rubies is pleasant, and the treatment not apparent to the untrained eye. However, care in wearing is essential for these types of treated rubies as the glass filling can be affected by common household cleansers as well as a jeweler’s torch. 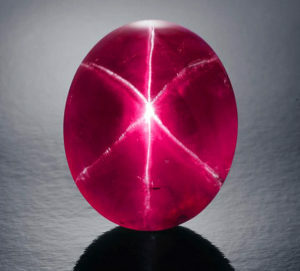 Star rubies are mined only in Burma and Sri Lanka. The star is caused by a reflection of rutile needles within the gemstone, intersecting in a hexagonal pattern (following the hexagonal crystal growth). As with sapphires, they are difficult to find due to the prevalence of heat treatments. The DeLong Star Ruby, weighing 100 carats, was stolen in an infamous jewelry heist in the 1960’s. A ransom was paid and it was dropped off at a phone booth in Florida and ultimately recovered. It is now on display at the American Museum of Natural History. July’s birthstone, ruby is a perfect option for rings, even for men, due to its hardness and durability. Many medieval Europeans wore rubies to secure health, wealth, and wisdom. Red is the color of passion, and ruby is thought to attract love. It is also believed to bring success in business. Ruby represents the 40th wedding anniversary.